Lovie Smith has a message to the fans after a brutal Week 7 loss to the Washington Redskins. When the Tampa Bay Buccaneers were up 24-0, all seemed to be wonderful. The Buccaneers were well on their way to 3-3 and were rolling right through the Washington Redskins. 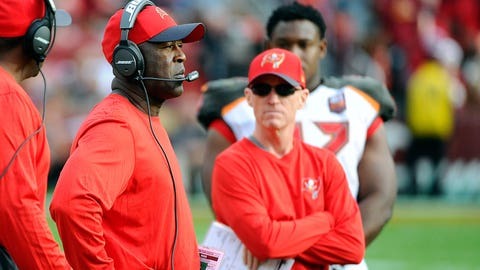 While the most common theme we’ve heard from Tampa Bay currently is how brutal the loss was on the team, Lovie Smith apparently has another message, according to JoeBucsFan.com. Smith’s comments probably don’t help any fans feel better after the loss, but at the very least, the head coach is right about the fact that his team is right there. The offense is finally clicking, and for a half, the defense looked very strong. Now, it all just has to come together and this team needs to "get over that hump," as Smith put it, sooner than later.